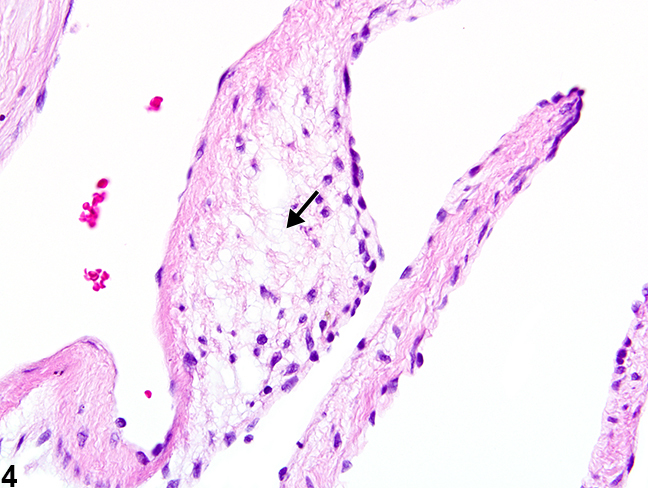 Heart, Valve - Degeneration, Myxomatous in a female F344/N rat from a chronic study. 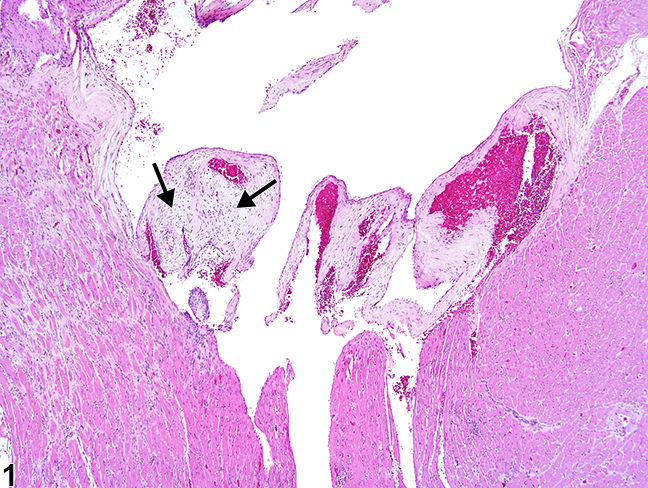 With myxomatous degeneration, the valve leaflets are often thickened (arrows). 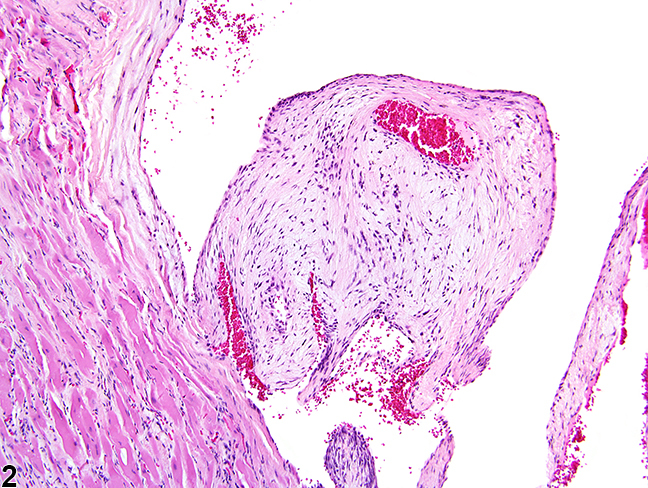 Heart, Valve - Degeneration, Myxomatous in a female F344/N rat from a chronic study (higher magnification of Figure 1). The valve leaflet is thickened and rounded. 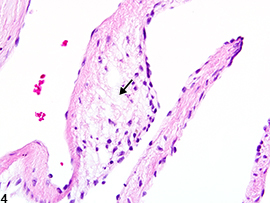 Heart, Valve - Degeneration, Myxomatous in a female F344/N rat from a chronic study (higher magnification of Figure 1). 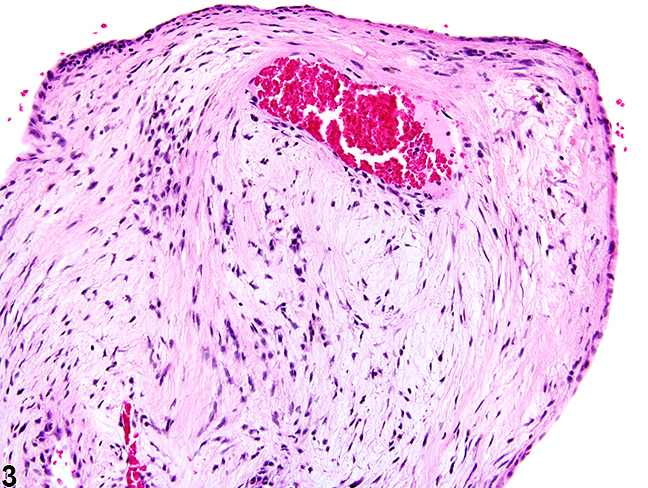 Abundant fibromyxoid tissue is present within the subendocardium, giving the valve a pale, basophilic, mucoid appearance. 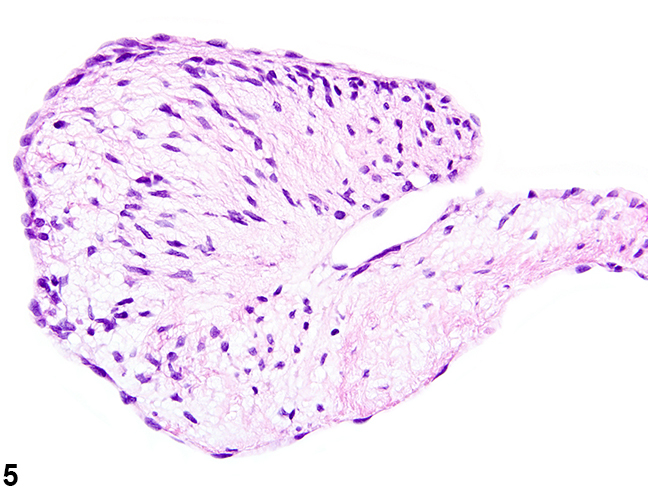 Heart, Valve - Degeneration, Myxomatous in a male Wistar Han rat from a chronic study. 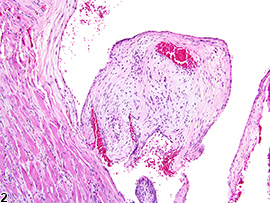 The spongiosa of the valve leaflet is expanded with myxomatous material (arrow). 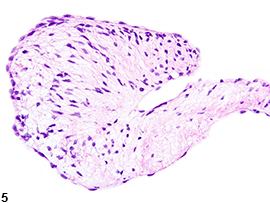 Heart, Valve - Degeneration, Myxomatous in a male Wistar Han rat from a chronic study. The valve leaflet has marked thickening due to fibromyxoid tissue in the subendocardium. 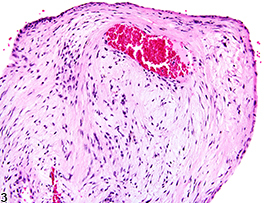 Valvular myxomatous degeneration (synonyms: spontaneous valvulopathy and valvular endocardiosis) can be an age-related spontaneous or chemical-induced change. The lesion is characterized by focal or segmental thickening of the subendocardium in the valve leaflets and expansion of the spongiosa of the valve leaflet with extracellular fibromyxoid material composed predominantly of glycosaminoglycans ( Figure 1 , Figure 2 , Figure 3 , Figure 4 , and Figure 5 ). Occasionally, fibrin deposits or thrombi and collections of neutrophils or mononuclear cells are seen. Myxomatous degeneration has been observed in the mitral, tricuspid, pulmonic, and aortic valves; however, in rats it has a strong tendency to involve the ventricular surface of the mitral and aortic valves, and in mice the pulmonic valve is reported to be most commonly affected. Heart, Valve - Degeneration, Myxomatous should be diagnosed and graded when present. However, heart valves are not protocol-required tissues in NTP studies and are not required to be included in routine sections. The distribution (i.e., which valves are affected) should be noted in the pathology narrative. Elangbam CS. 2010. Drug-induced valvulopathy: An update. Toxicol Pathol 38:837-848. Elangbam CS, Colman KA, Lightfoot RM, Tyler RD, Wall HG. 2002. 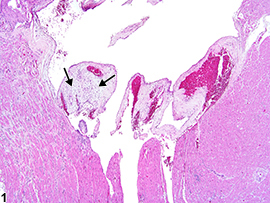 Endocardial myxomatous change in Harlan Sprague-Dawley rats (Hsd:S-D) and CD-1 mice: Its microscopic resemblance to drug-induced valvulopathy in humans. Toxicol Pathol 30:483-491. Elangbham CS, Wehe JG, Barton JC, Krull DL, Nyska A, Crabbs T, Kissling G. 2007. Evaluation of glycosaminoglycans content and 5-hydroxytryptamine 2B receptor in rat heart valves with spontaneous mitral valvulopathy - a possible exacerbation by dl-amphetamine sulfate in Fischer 344 rats? Exp Toxicol Pathol 58:89-99. Elangbam CS, Job LE, Zadrozny LM, Barton JC, Yoon LW, Gates LD, Slocum N. 2008. 5-Hydroxytryptamine (5HT)-induced valvulopathy: Compositional valvular alterations are associated with 5HT2B receptor and 5HT transporter transcript changes in Sprague-Dawley rats. Exp Toxicol Pathol 60:253-262.